What a lovely seasonal tale this is - the subtitle says it all. Holly Martin shows what a wonderful story-teller she is in this book with wonderful descriptions of settings and people on every page. I was instantly drawn into the world of the heroine of the story and found it a difficult one to put down. The central character is Penny, the owner of Lilac Cottage, so prettily illustrated on the book's cover. The 'cottage' itself sounds a great deal bigger than its name suggests, with its special areas to cater for Penny's ice sculpting business and its annex which is big enough to rent out as a home to another couple. That pair, Henry and Daisy, are the other main characters in the story. The small seaside town of White Cliff Bay, in which the story is set, sounds a lovely place to live. Everybody knows everybody else's business, but in the best possible way. There is a real sense of community that comes over well in Holly's writing. We see them all pulling together in times of need. While this is mainly a romance, there is also plenty of drama and a bit of humour in the story. It had me laughing out loud one minute and sitting on the edge of my seat the next. In the end it left me with a happy smile on my face. 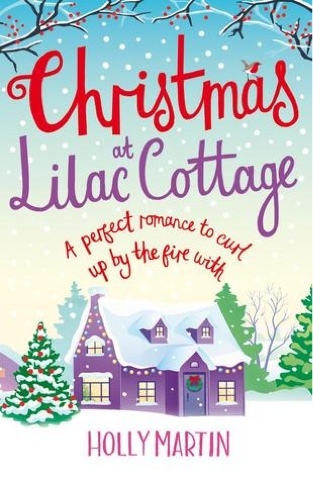 I would recommend this book to anyone who enjoys a romance with a Christmassy feel. I'm looking forward to reading more about happenings in White Cliff Bay.